The recently-revealed Chinese ‘Dark Sword unmanned aircraft, already dubbed a “nightmare for the US,” might be the first military flyer to achieve the “sixth generation” milestone. The recently-unveiled Chinese unmanned combat air platform known as Dark Sword might be the first sixth-generation warcraft, according to Militarywatchmagazine.com. At this point, "4++"- and fifth-generation aircraft are mostly limited by the durability of the human pilot. Today, pilots survive thanks to pressurized inflatable suits, oxygen masks and extreme physical training. Increasing a plane's maneuverability would certainly crush a human pilot, necessitating a call for unmanned warcraft. 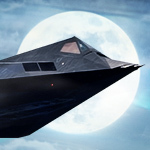 Both the United States and Russia have experimented with unmanned aircraft, with the US cancelling its program despite Northrop Grumman presentation of an X-47B demonstrator vehicle which looked like the infamous F-117 but squashed flat by a steamroller. Russia, on the other hand, seeks to implement unmanned capabilities into its existing machines, very much like it did with its ground armored vehicles. At this point, it is unknown whether Dark Sword will also operate as manned or whether it will be strictly unmanned. Being unmanned embraces being susceptible to electronic attacks, particularly command channel jamming. Similar to a cyberattack, this becomes a constant race for more sophisticated swords and shields. The expenses are justified, however, by granting an unmanned jet maneuverability beyond anything that armies enjoy today. "The Dark Sword is also likely to carry the most advanced Chinese-made air-to-air missiles and be able to operate at several times the speed of sound over extreme ranges, making it a lethal threat to hostile platforms across the South and East China Seas and a potentially invaluable asset," cited by Militarywatchmagazine.com. It should be noted that the definition of a ‘sixth-generation jet' is not yet defined. According to some, the jet must include direct-energy (laser) weapons and missile defenses and/or cyber-attack capabilities — apparently this means the plane should be able to hack the adversary's systems remotely — and travel at much longer range. Taking the US Navy's Triton heavy surveillance drone as a starting point — with a 15,186-mile maximum range, 30-hour endurance and a flight ceiling of 18,000 feet — reports claim that the Chinese machine would likely surpass those figures, allowing Dark Sword to operate in Japan, much of Southeast Asia and significantly increase China's anti-access-area denial (A2/AD) capabilities in the East and South China Seas. One proposed possibility would see a Dark Sword operating in conjunction with manned J-20 fifth-generation fighters. If AI systems are sophisticated enough, a J-20 pilot would only need to point at a target using a brief wireless communication burst for the autonomous Dark Sword to engage. What makes Dark Sword particularly unsettling, though, is that it does not need to be that sophisticated. "At the very least [Dark Swords can] soak up missiles from US fighters," Justin Bronk of British think tank Royal United Services told Business Insider. "If you can produce lots of them, quantity has a quality of its own." The definition of a sixth-generation aircraft would then simply entail: "cheap, expendable and swarm-capable unmanned drone." I think that this drone is a nightmare for the Chinese, if it is like the cheap, shoddy goods that they export to world. Good targets for a US Navy aviators with a full load of AAMs. China’s Unmanned Aerial Vehicles development in general corresponds to global trends. Though in view of its technological lag that existed until recently, Beijing emphasized copying US and Israeli craft. China, however, has made a qualitative leap in the last 10-15 years in establishing its own UAV scientific and technological infrastructure. The new Chinese UAV types are equal, and in some respects even superior to their US equivalents. They have a competitive price and, therefore, high export potential. This is true, for example, for the reconnaissance CH-5 (Caihong-5). Today such craft are mainly used in operations against asymmetrical and, as a rule, technologically less well equipped adversaries like small states, contested grounds via indirect war by proxy, terrorist/rebel forces, etc. At the same time, given the current level of technology, it’s difficult to imagine a conflict among big players without massive UAV use. Unlike the US, China does not have its own wealth of experience in UAV combat use, though some believe that Chinese drones used, for example, in Myanmar and Laos, are flown by Chinese operators. The PLA actively uses drones for surveillance of maritime and land borders, and for combating piracy. UAVs play a big role in PLA’s missions in pursuit of Chinese regional and global interests. Beijing seeks to create military capabilities enabling it to act effectively both in indirect and direct clashes with a technologically advanced adversary, which first and foremost includes the United States. Therefore China’s military and political leaders have pursued the development of novel weapons types, including supersonic and hypersonic UAVs. One of such future UAV development paths is the AVIC 601-S program. It had led to the construction of such experimental vehicles as Sky Crossbow, Wind Blade, Cloud Bow, Warrior Eagle, Sharp Sword, and Dark Sword. Chinese scientists are actively experimenting on various layout schemes (flying wing, forward-swept wings, etc.) and technological innovations in order to arrive at optimal solutions for UAVs, in order to increase their speed, maneuverability, and stealth. The Dark Sword (Anjian), whose photos appeared in the media in early June, is a qualitatively different UAV, according to expert assessments. Dark Sword’s conceptual model was initially demonstrated to the public in 2006 a the Chkhuhai airshow in the Guandong Province, and at the 47th International Air Salon at Le Bourget in 2007. Alleged Dark Sword flight photos appeared later, in 2011, but their veracity is doubtful. 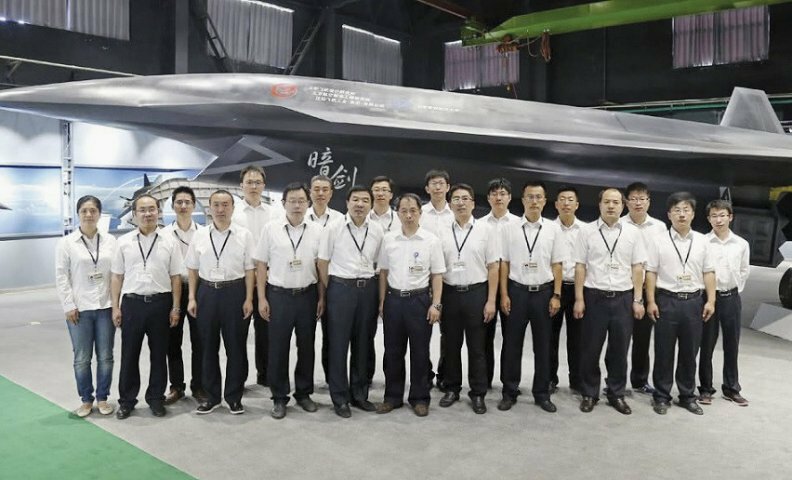 The Dark Sword was being developed by the Shenyang Aeroplane Design Institution as part of the aforementioned AVIC 601-S program. Its development and production costs are unknown. The limited information available in open sources makes it difficult to draw accurate conclusions concerning its characteristics, which led some to claim it is capable of hypersonic speeds. Updated conclusions and assumptions have been made mainly on the basis of a Dark Sword photo which appeared in the Internet. According to some estimates Dark Sword can reach Mach 1, though others claim it’s Mach 2. This is suggested by the tail control surfaces and also the Diverterless Supersonic Inlet (DSI). Its use allows to reduce air resistance at high speeds and radar observability. Similar technologies ae being used on the Chengdu J-20 and J-31 fighters, and on the US F-35 Lightning II. Dark Sword ought to have high maneuverability thanks to its canard layout and twin vertical stabilizers. Its stealth is enhanced by the use of radar-absorbing materials and the above-mentioned DSI air intakes. It’s believed Dark Sword could be produced in two variants, manned and unmanned. It will most likely be armed by the most advanced Chinese missiles, such as the PL-15 and its variants. Experts’ views on the Dark Sword development vary. According to the Military Watch Magazine, Dark Sword could enter operational use in the near future and thus become the world’s first 6th-generation fighter. It can’t be ruled out, however, this is only an experimental testbed to test a variety of next-generation technologies. Justin Bronk at RUSI notes that “we only see that which the Chinese want us to see”. Therefore we can’t assess the veracity of the photograph or reflect on the circumstances in which it was made. Thus it is unknown whether China is actually financing a project which will soon reach its completion phase, or is merely trying to induce other countries to spend money on similar costly projects with uncertain future. It is highly probable that the Dark Sword and other AVIC 601-S program vehicles are mainly experimental. But if Dark Sword becomes an operational weapon, it will have a fundamental impact on the wars of the future. The Chinese UAV could be used not only for reconnaissance and ground target strikes as part of the existing UAV doctrine, but also break through enemy defenses and strike deep targets. It could operate independently as a strike UAV or as part of a force package, supporting piloted aircraft. Given its extended range, it can be used to attack land, air (including other UAVs) and naval targets, for example, carrier battlegroups. Dark Sword could be further developed for aircraft carrier operations. Dark Sword will become a delivery vehicle for various weapons, including long-range air-to-ground and air-to-air missiles, but in the future also lasers. It could also carry mobile and highly effective electronic warfare systems to disrupt land forces, air, and naval communications systems. One has to consider the possibility Dark Sword could be used as a “suicide” UAV, but that’s not as likely considering its cost. UAV operator training should take less time and money than pilot training, since their level of qualifications is much lower. Other countries could respond to the Chinese challenge in several ways. From the technical point of view, other countries will seek to create similar high-speed UAVs in conjunction with already existing systems. This approach would require considerable expenditure and time. It’s highly likely the US will continue the development of own hypersonic technologies. Another approach is improving air defense, electronic warfare, and, possibly, lasers, capable of “burning” its electronic payloads. Since UAVs depend on communications systems, this appears to be the optimal approach. Russia, which lags in UAV development, will seek to improve its electronic warfare systems which have traditionally been the Russian MIC’s strong suit. The US will do the same. From the point of view of military planning, there will occur a reconceptualization and perfecting of existing approaches. Particular emphasis will be placed on reconnaissance and intelligence efforts to locate UAV command posts and strike them using all available weapons. China thus managed to establish an industrial foundation over the last few decades to produce own UAVs. This is a manifestation of China’s political strategy and is driven by Beijing’s desire to consolidate its position as a superpower technologically on a par with the US. As already existing models enter service and future projects are developed (for example, improved air-to-air missiles and others), China will greatly improve its standing both on a regional and global scale. China’s ability and readiness to perform a wide range of missions in regions with high conflict potential will also increase. At the same time, China’s main competitors and potential adversaries will also grow concerned with Beijing’s ascendancy, potentially leading to an escalation of global tensions. Thanks for flying top cover for me. Give the guy his head and he will self destruct in his Commie posts. He is full of it. Mlad should build a campaign to show us how his theories are feasable. Well let's think about it. China has made industrial and commercial espionage a national pastime. Through breaches in US security due to idiocy, politics, or "China is trustworthy aren't they, they like money?" China has been able to gain significant information on Western-made hardware. Once upon a time we used to get our chips from Taiwan and now a lot of them come from China because they've been able to steal the designs and replicate them cheaply, thus winning the battle of "Would I buy the same chip for $5 from Taiwan on $2.50 from China?" It's entirely possible that they've gained enough intelligence via espionage to compete on the 6th generation level. They've certainly learned far more than the Russians ever did via espionage. The biggest hamper to the Soviets making the F-117 wasn't the knowledge it was the manufacturing, they were simply too far behind us on the curve to do such a thing. That is evidence in their propeller designs as well for submarines. China, on the other hand, has stolen just about everything they can steal and they'll continue to do this. Of course, the planes will still be stamped "Made in China" so that remains to be seen but I would treat China as a player on this front. The last thing the US needs to do is assume China cannot compete and then wake up one day to see the PLAAF and the PLAN actually doing something with themselves. Power is often linked to military and economic strength, but technology and innovation are likewise critical to understanding how domestic resources are translated into policy outcomes. In the information age, countries must be able to use technology effectively in order to secure their national security objectives. Furthermore, a country’s ability to develop innovative products or methods of production enables it to generate new sources of wealth. There is no 6th gen tech yet to steal... That is why this is pure BS. China has never invented anything past gunpowder. That's just it - they're positioned TO steal it as it goes past the theoretical and into the application phase. They've already managed to steal enough to make the J-31 and the J-20. What those are *actually* like remains to be seen naturally but the fact that they've managed to get those programs off the ground in a fraction of the time that we took on the F-22 and the F-35 shows just how extensive their espionage is. We've done all of the ground work, the testing, the prototyping, and the troubleshooting already. We've done all of the hard work, they've just spent time putting the pieces together. We are number 1. The only real super power in the world for decades. The GOOD OLD USA, LAND OF THE FREE AND HOME OF THE BRAVE!! Time is in favor of China. Washington realized that over the next few decades, the Middle Kingdom would continue to ramp up, gradually gaining market share and imposing its global technological leadership. Technological innovation is the driving force of China's economic development for the years to come. China aims to become a world leader in innovation by 2035, knowing that the country is already the second largest investor in the world in R & D and the world's largest patent filer. This will not have escaped the United States, who have detected the threat and are now trying to stop - even to stop - this progression, which seems to us - unfortunately for them - quite inexorable. Neither the J-20 or J-31 arent practical platforms and have limited stealth and horrible engines... China is a joke.